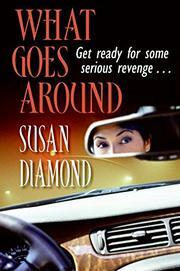 Diamond, a former writer for the Los Angeles Times, pens a satisfying novel of revenge and female empowerment amid the movers and shakers of Los Angeles. Beautiful Ginger Pass kept a mighty secret—when her husband was away on business, she became a high-priced prostitute. Those few in the know are the five women in her therapy group, successful women dissatisfied with their lives. When Ginger is found dead in a men’s club, and the police casually rule it an accident, the women from her group decide to investigate. What they discover is foul play. In short order, they learn that Ginger spent her last night with L. Walker Cannon, Senate candidate; Mitchell Reinhart, a divorce lawyer who crushes wives in court; and Milo Till, a big-shot land-developer. Till acknowledges a meeting but tells the police that she left his company very much alive (the story’s weak spot—one would think the death of a millionaire’s wife would effect a bit more police investigation). The women from the group decide to mete out justice in their own special way, each of them bringing her own useful skill set, cleverly shaping their plot for revenge. Charlotte is a lawyer, Kat is the comely owner of a chain of upscale gyms, Dinah is a doctor, Justine works for the county’s assessor’s office and Polly’s made a fortune off the stock market. First, they set their sights on Cannon, a GOP puppet running on a family-values platform—thanks to Kat, a lacey bra and a well-timed photo op, his career is easily undone. Then, because of Justine’s expertise in agriculture (her family’s business), Reinhart is next for ruin, leaving Milo Till, the dangerous one, who happens to take a shine to Dinah. The plotting, usually engaging in building its complicated schemes, is sometimes slowed by the explanation of, say, tax codes. But the payoff—justice for Ginger and meaningful life changes for her avengers—is worth the wait. Strong, genuine characters make this more than a simple tale of murder and the clever machinations of revenge.